We will take you for a journey from flight theory through beginner level to flying solo!! Our training site is located 30km west of Dublin, Ireland. 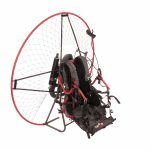 Over 5 days powered paragliding course you should be able to fly on your own under instruction, all equipment provided. Try us before overpaying abroad. We can give you best impartial advice. Training is weather depended. At times it is hard to plan for a few days ahead. Day before we send text message for following morning. Please ask for details here. Call Cathal Fowler on 086 838 9644 to find out more. We have school equipment from different manufacturers and we can give you best advice to suit your needs and skills. Lately we started cooperation with AirConception - great performance, very light and reliable engines! 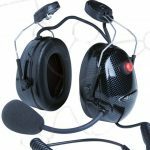 We believe that this manufacturer, based in Paris, has best equipment on the market to suit all types of pilots. 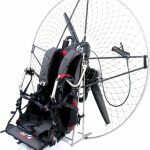 All AirConception paramotors are fitted with low hang point harnesses, making them exceptionally safe, comfortable and easy to fly. 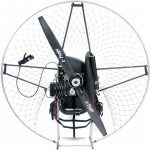 Delta and Titanium models are the latest in Paramotor design and are fitted with powerful Nitro200 engine. 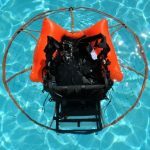 Choosing the right size glider ensures proper performance and safety. Dudek, one of the biggest and best manufacturers of paragliders in the world, is renowned for their high quality and attention to detail. 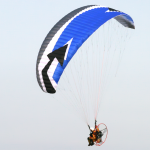 We are an official dealer for Dudek which has a wide range of beginner, intermediate and advanced wings. 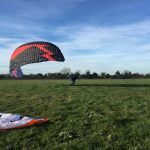 Paramotoring Ireland uses the Dudek Universal in the school and recommends it to students who have completed their training. Reserve parachute is a must. 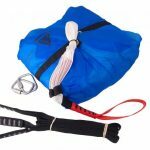 This is a last chance survival option in the unlikely case of a catastrophic wing failure or pilot error. The reserve can be mounted in several different places for easy access in an emergency. 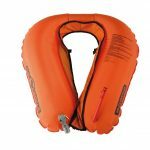 Water rescue system. The U-shaped device has single-use CO2 bottle and a sensor located down low on one side. When the sensor gets submerged inflation is very quick, probably about 1 second and it will remain at least 90% inflated for probably several hours. 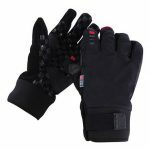 Industry offers a wide range of additional accessories. 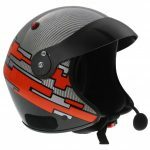 These include helmets, headsets, harnesses, clothes, varios and more. For further information and deals give us a shout here. That depends on weather conditions and one's progress. Usually after 4-5 days you should be airborne on your first flight! To master your skills takes much longer. 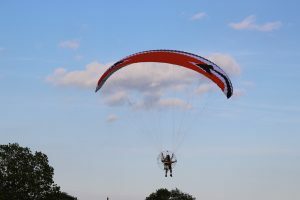 Find out if flying is a sport for you! 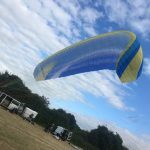 On our site which is nice vast grass covered field with unrestricted air space, you can learn and practice all necessary skills to make you feel confident to fly on your own. The sky is not a limit.